Summer Portrait, Merry Child Among The Dandelions. Smiling Girl With Crown Of Dandelions Flowers Lies On The Green Grass On The Lawn. Child Reads Thick Book With A Red Apple. Soon Back To School! Lizenzfreie Fotos, Bilder Und Stock Fotografie. Image 100428520. Standard-Bild - Summer portrait, merry child among the dandelions. 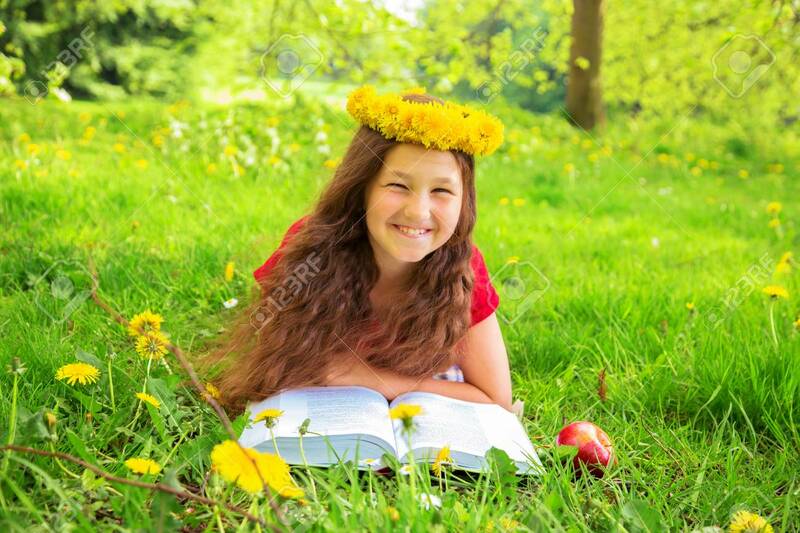 Smiling girl with crown of dandelions flowers lies on the green grass on the lawn. Child reads thick book with a red apple. Soon back to school! Summer portrait, merry child among the dandelions. Smiling girl with crown of dandelions flowers lies on the green grass on the lawn. Child reads thick book with a red apple. Soon back to school!